[New York, November 2009] – Plymouth Rock Assurance, High Point, Palisades, Pilgrim, Mt. 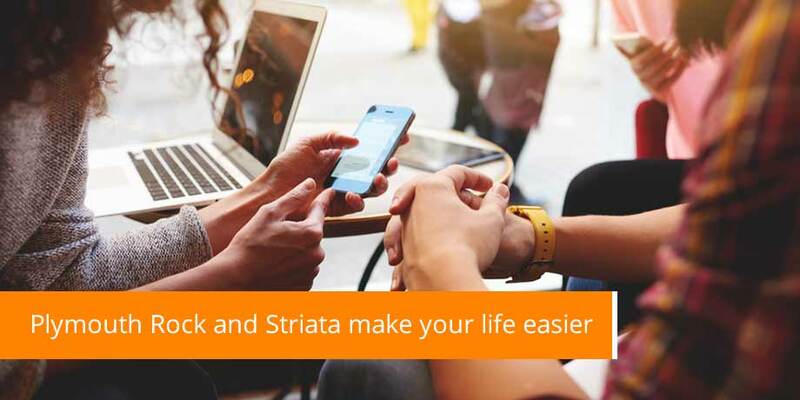 Washington Assurance, and Bunker Hill Insurance Companies have all chosen Striata to securely deliver electronic policies, renewals, bills and statements. Shared Technology Services Group Inc. (STG), a Plymouth Rock Company, develops, manages, and maintains technological solutions for the Plymouth Rock Group of Companies. One of the Plymouth Rock Group’s primary goals is to deliver more convenience and customer satisfaction to policyholders. Early in 2008, STG embarked upon an initiative to bring paper suppression strategies and solutions to the entire group, to improve the overall customer experience, and help reduce operating costs. Paul Luongo, President of STG, said: “Our eDocument project has been a great success to date. Implementation was quick, efficient, and very well-managed. Striata has enabled us to go to market with a quality solution that is not only achieving our customer satisfaction goals, but is exceeding our goal to convert paper to electronic documents. In order to maximize ease of use and customer convenience, policy documents, bills and reminders are securely delivered to the customer’s e-mail inbox as encrypted PDF e-mail attachments. This approach eliminates the need to review and store cumbersome paper documents or to log-in to a website to search for these documents. As an added convenience, Striata BillPay, powered by Speedpay®​ ​service ​​​​(A Western Union Company) Global Payment Services, allows eBill recipients to pay electronically with just a single click from within the PDF eBill itself, without the need to pre-register or visit a single webpage. This is another example of how Striata’s push eDelivery strategy offers a fast, secure user experience for the highest levels of customer satisfaction. In addition to the delivery channel for electronic insurance documents, each of the Plymouth Rock insurance companies can utilize Striata’s intelligent marketing engine to include personalized marketing inserts and overlays (at no additional cost), which link customers to the company’s website for further information. The inclusion of targeted messaging within transactional e-mails and important customer documents such as policies greatly enhances take-up rates and also reduces churn. “Our goal is to maximize the conversion to paperless, making it easy for policyholders to conduct business through the Internet and to embrace environmentally responsible customer communications,” added Mr. Luongo.